Once you have learned crochet basics, you can begin working with all of the wonderful crochet patterns that are out there. However, unless you happen upon a pattern that is written tutorial-style, with all of the photos and details that you need for each row, you’re going to first need to learn how to read a crochet pattern. Learning how to read a crochet pattern can feel intimidating at first; it really does look a lot like a foreign language. But once you know how to break a pattern down, it becomes easy, and once you know how to read one crochet pattern, you’ll be able to read almost any crochet pattern. For this guide, we are going to break down the Dragon Wing Scarf free crochet pattern designed by Jessie At Home. This guide shows you portions of the pattern for the purpose of teaching you how to read a crochet pattern. She does a great job of executing every part of a crochet pattern, making this a perfect choice for learning how to read patterns. 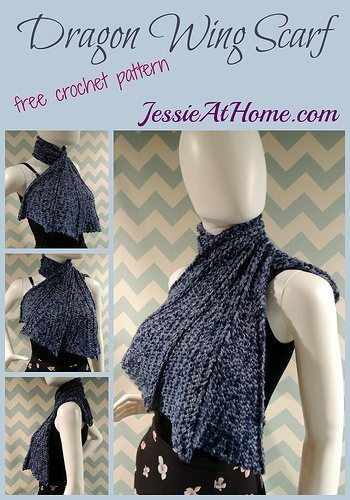 If you want to get the full crochet pattern to make this beautiful scarf, you can find it on Jessie’s website. The first thing that you’ll typically see after the name of a crochet pattern is a description of the piece. Although you can tell a lot by looking at a crochet designer’s photos, you want to read this extra info to make sure that you want to work the pattern. We can tell from the beginning of Jessie’s description that she also has this pattern in a knit version; if you are able to both knit and crochet then you might decide you want to knit it instead! A thorough crochet designer will include the “skill level” of the crochet pattern. Jessie lets us know that this one is “intermediate”. Designers may each have their own criteria for determining this, but generally you know that an easy or beginner level pattern only requires knowledge of basic stitches, an intermediate pattern may require more advanced stitches or some shaping and an advanced pattern may require special techniques. Don’t let a pattern’s skill level deter you from trying out something you really want to make; just go in to it with the right expectations. Before you begin working on a crochet pattern, you need to look at the part of the pattern that tells you what you will need to crochet this project. You will learn what yarn was used by the designer and how much of it was required. A thorough designer will not only tell you the yarn that was used but will also tell you about that yarn. In this case, Jessie gives us a breakdown of the fiber; if you wanted to substitute a different yarn, you might look for one with a similar percentage of each fiber to get the closest possible to her design. Alternatively, the designer may just tell you a yarn weight; if it says a DK weight then you might substitute another DK weight yarn but wouldn’t use a bulky yarn. This section will also tell you what size crochet hook to use. You will also find out if you need any additional materials; for example, if this were an amigurumi pattern instead of a crochet scarf pattern, you might need to buy polyfill stuffing and toy eyes. Some designers also let you know about optional materials, such as a tapestry needle for weaving in ends (which you may choose not to get if you prefer to weave in your ends with your crochet hook). Sometimes this section of the pattern is also where the pattern show the finished size of the project; that way if you want to adjust the size yourself then you’ll have a good starting point for guessing how much yarn you’ll need. Even if you don’t intend to adjust it, it’s important to know what the intended size of a project is – and whether there are instructions to make different sizes – so that you end up with the item you intended to make. In the pattern selection above, we see that this scarf is going to be 36″ long and 23″ at the widest point. Speaking of finished size, it is highly recommended that you make a gauge swatch for most crochet patterns, particularly where the finished size needs to be exact. Crochet designers will include gauge information in their patterns. Some designers will only include the numbers (such as the “8.5 spider sts by 16 rows” that Jessie shares above) while other designers will provide extra detailed information to help you get your gauge swatch right (which Jessie also does in the original full pattern). You use this information to make a swatch to make sure that your stitching matches that of the designer. If it doesn’t, you need to adjust your tension or hook size in order to get it to match so that when you go into making the full pattern it turns out the right size. A thorough crochet designer will include a section of crochet stitches. 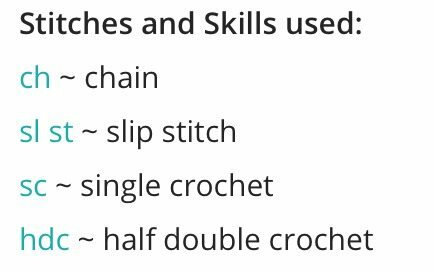 This should tell you which stitches are used in the pattern, which abbreviations the crochet designer has chosen, and the instructions for any special stitches beyond the basic stitches. When a crochet designer doesn’t include this, it can usually be assumed that the pattern uses the standard crochet abbreviations accepted in the industry (such as sc for single crochet). The first thing you should look at in this part of a crochet pattern is whether or not you are familiar with all of the stitches. If there is a stitch on the list that you haven’t learned, you need to locate a source and practice the stitch. For example, let’s say that you are a beginner crochet who hasn’t yet learned how to half double crochet. You can see that Jessie’s pattern uses this stitch, so you would need to find a resources for hdc and learn it before proceeding with the pattern. Note that many online pattern designers will link to their own tutorials of the stitches used in the pattern to help you out. Crochet books and magazines often have a basic stitch guide at the beginning or end to assist you. The other thing that you want to look at in this section is any information on “special stitches”. We don’t have any listed in Jessie’s pattern, but let’s say for example that the pattern uses a v-stitch. Under special stitches, the designer tells you what a v-stitch means in this pattern. In most cases, people will assume that a v-stitch is worked as dc, ch 1, dc but let’s say that in this pattern the designer says that a v-stitch is dc, ch 2, dc. It’s not your job to argue with the pattern designer; the designer has provided this information right there in the “special stitches” section so that you know exactly how to work that stitch for this particular pattern. Even if you think you know how a stitch is worked, read this section carefully before you begin. Once you have decided on a pattern, selected your materials, checked to make sure you understand the stitches and are ready to go, it’s time to dig into the pattern. The pattern is typically written as row-by-row instructions, using abbreviations. We will break down the section of Jessie’s pattern shown above to help you learn how to read a crochet pattern. It can look overwhelming when you haven’t done it before, but as you read along, you will see that each row can be broken down into tiny steps until you understand exactly what you need to do. Ch 8 – We begin the row with a “chain 8”. Note that in many patterns you will get the instructions for a starting chain before the row 1 instructions; it might say “ch 38” as an example and you would start with a chain of 38. In this case, the ch 8 is not just the starting chain but also the beginning of row 1 because this is a slightly more advanced pattern. sl st in 7th ch from hook – This tells you to slip stitch in the seventh chain from the hook, so you’ll count seven back away from the hook and make a slip stitch. [ch 12, sl st in 7th ch from hook] 4 times – Usually when you see [brackets] in a crochet pattern, it indicates that whatever is in the brackets is going to be repeated. So you will chain 12 and slip stitch in the 7th chain from the hook (like it says in brackets) and you’ll do that four times total (as it indicates to you after the brackets). ch 2, turn -After you have repeated the part in brackets the total four times, you will chain 2 and then turn the work. hdc in 2nd ch from hook – Work one half double crochet in the second chain from the hook. * ch 7, skip ch-7 loop, [skip 1 ch (sc, ch 2, sc) in next ch] 2 times – This set of instructions includes the brackets, which you already know are mean to repeat something. They also include an *, which is another indicator of an upcoming repeat. And they include ( ), which typically indicates a group of stitches all worked into the same stitch. So, for this one, you are going to chain 7 and skip over the ch-7 loop you created previously. Next you will skip 1 chain. You will work one single crochet, chain two, one single crochet all into the next stitch (the parentheses help remind you that they are all worked in the same stitch.) Then it says “2 times”; this means that you will repeat the part in brackets so one more time you will skip one chain and then work one single crochet, chain two, one single crochet all into the next stitch. repeat from * 4 times – As mentioned before, an * often indicates a repeat, and we see that here. You are supposed to repeat the previous step four more times. So you’ll do the whole thing shown above – ch 7, skip ch-7 loop, [skip 1 ch (sc, ch 2, sc) in next ch] 2 times – 4 more times. ch 7, skip ch-7 loop, hdc in last ch – Now you will chain 7, skip the ch-7 loop, and make one half double crochet in the final chain stitch of the row. Your row is complete. As you can see, in this pattern the next set of steps if for “rows 2-58”. This means that you follow all of the steps below, repeating them all for each new row, until you have completed row 58 of the pattern. Each of these rows is worked exactly the same as one another. Turn – Most crochet designers will indicate when it is time to turn the work, as Jessie has done here. If the designer doesn’t say this for a project worked in rows look for instructions that say “not to turn” somewhere at the beginning of the pattern; if you don’t see that then you can assume you will turn at the beginning of every new row. ch 1 (does not count as a st here or throughout) – The first chain of a new row is called the turning chain. Here is it a chain 1. Usually a designer will indicate whether this does or does not count as the first stitch of the row (which tends to vary with stitch height). Here, Jessie has told us not to count it as the first stitch. This means that we know when we turn the row again, we can ignore this stitch rather than working into it. hdc in hdc – This tells us that we should make one hdc in the hdc from the row below. If for some reason you have reached this point and don’t see that half double crochet in the row below, you’ve made a mistake and should start over. The great thing about crochet is that it’s easy to start over and try again, and instructions like this one help you stay on track with where you should be in the pattern. [ch 7, (sc, ch 2, sc) in each of next 2 ch-2 sps] 4 times – You already know that the brackets mean there is a repeat and the ( ) mean you work all of that into the same stitch. So what this tells us is to chain seven, then work single crochet, ch 2, single crochet all into the ch- 2 space and then work single crochet, ch 2, single crochet all into the next ch 2 space … and then to repeat all of that (beginning with the chain 7) a total of four times. ch 7, hdc in last hdc – After you have worked all of your repeats, you will chain 7 and then hdc in the last hdc of the row. When you reach the final instructions for the row, you should be at the end of the row (unless the designer has specified otherwise); if you aren’t then you’ve made a mistake and should start over. Let’s look at one more row to make sure we’ve got the hang of how to read a crochet pattern. Turn, ch 1, hdc in hdc, ch 7 – You will turn the work, chain one (which we know from before does not count as a stitch), work one half double crochet into the half double crochet from the row below and then chain seven. (sc, ch 2, sc) in each of next 2 ch-2 sps – The ( ) mean that you will work all of that into the same stitch, in this case into the chain-2 spaces so you should make one single crochet, chain two and one single crochet into the next ch-2 space and then do that again in the following ch-2 space. [ch 7, (sc, ch 2, sc) in next ch-2 sp, ch 1, (sc, ch 2 sc) in next ch-2 sp] 2 times – In this step, we are once again working with both brackets and ( ). So, you’re going to chain seven. Then you will work one single crochet, chain two, one single crochet all into the next ch-2 space, chain one, then work one single crochet, chain two, one single crochet all into the next ch-2 space into the following ch-2 space. Then, because that was in brackets, we repeat it for a total of two times. ch 7 – The great thing about crochet patterns is that even when they look very complicated, you can break them down step-by-step and they become manageable. So in this step, it’s just a chain 7. You know how to do that. (sc, ch 2, sc) in each of next 2 ch-2 sps – This tells us, of course, to work one single crochet, chain two, one single crochet all into the next ch-2 space and to do that again in the following chain space. ch 7, hdc in last hdc. – Finally you will chain 7 again and work one half double crochet into the final half double crochet of the row. Alternatively, there might be instructions about how to add a border, seam different portions of the project together, add buttons or otherwise complete the finishing touches. These are typically spelled out, without abbreviations or using only common abbreviations, to help you wrap up the project. Sections of instructions. When a crochet pattern is made in more than one part, you might have row-by-row instructions for each section. For example, a crochet sweater pattern might say “arms (make 2)” and it will have the row-by-row instructions for the arms, which you are to repeat to get two arms, of course. Information for different sizes. Often a crochet pattern will be made in different sizes. Typically, the instructions are given for the smallest size, then the instructions for other sizes are given in brackets or parentheses (not to be mistaken with brackets / parentheses used in the manner above). Sometimes the designer will use color changes instead of, or in addition to, brackets / parentheses. For example, a set of instructions might read S (M, L) and row 1 might say Chain 10 (12, 14), which indicates that if you want to make the small size, you will chain 10, for the medium size you will instead chain 12, and for the large size you will instead chain 14. Crochet tips. Sometimes a designer will include additional helpful information in a sidebar, something often seen when patterns are printed in crochet books. Symbol charts. Crochet patterns are usually written out in instructions like those shown above. However some patterns are written as symbol charts instead. These require their own language to learn in order to decipher them; once you’ve learned how to read a symbol chart, it can be a nice bonus addition to a written chart. Graphs. Some types of crochet use graphs in addition to or instead of written instructions. Filet crochet, pixel crochet and tapestry crochet are a few examples that might have graphs. Drawings / schematics. When a crochet pattern is made of several parts that must be joined together, the crochet designer might include drawings that make it clear which pieces go where.